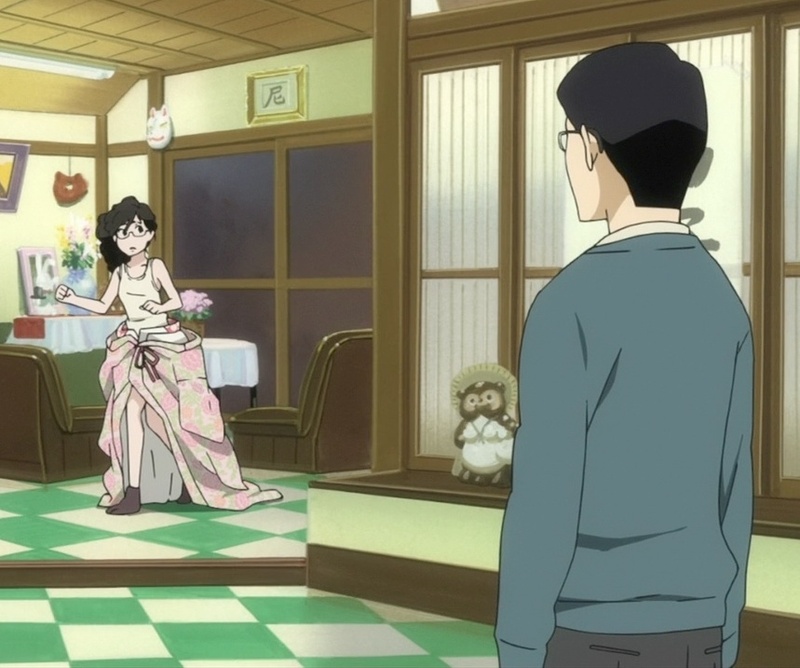 Episode 4 of Kuragehime, “Let’s Meet at the Aquarium” (水族館で逢いましょう), begins with the Amamizukan residents cooking sweet potatoes, where Tsukimi suddenly has a flashback to a similar situation with her mother. Except her mother had doubled over at the end, so it’s a sad flashback that sends Tsukimi into a crying fit to the confusion of the other residents. Meanwhile, Shuu still has no clue that Tsukimi is the lady of his dreams, while Kuranosuke still has no clue where his mother is despite having broken into his father’s room. 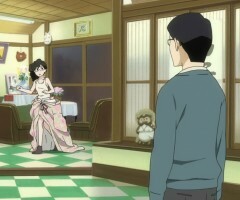 Kuranosuke does get the clue he missed in the previous episode when he comes across a copy of the redevelopment plan involving the area around the Amamizukan. This has him running in panic to the Amamizukan to warn the residents, except it turns out that they are already quite aware of the plan and are throwing their support to the opposition. After having the wind taken out of him for being the only one panicking, Kuranosuke decides to tag along Tsukimi, who is going to an aquarium to see jellyfish, something she does when she feels depressed. Kuranosuke just doesn’t tag along, however, as he dresses Tsukimi up in a kimono borrowed from Chieko. He couldn’t help himself from playing dress up with Tsukimi after admiring Chieko’s kimono collection so much given his own hobbies, which would probably raise Chieko’s opinion of him the most. But more happens to torment Tsukimi, as Shuu volunteers to drive her and Kuranosuke to the aquarium. 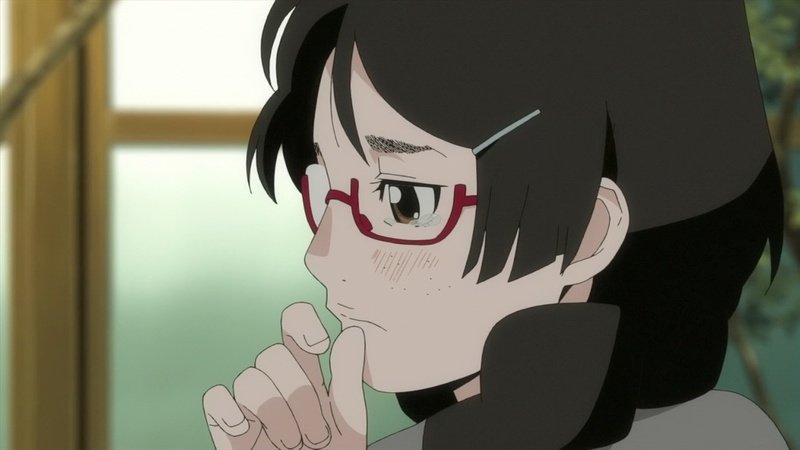 At least she doesn’t have a problem talking normally to him, thanks to her blurred vision due to Kuranosuke confiscating her glasses for the sake of fashion. However, once at the aquarium, the interaction between Tsukimi and Shuu annoys Kuranosuke for some reason, so he heads into the ladies’ room to take off his feminine attire. This may have not been the best of ideas, since when he comes back he finds Shuu hugging a crying Tsukimi. Considering how he was drawn to Tsukimi earlier after seeing her laugh for the first time, he gets frustrated that he recognizes that what he is feeling is jealousy. It turns out that Shuu was hugging Tsukimi because he didn’t know what else to do when she started crying for no apparent reason. The reason that Tsukimi started crying is that she misses her mother so much, remembering the time when they were together at an aquarium the last time, which she does not explain to the others. At least the incident prompted Kuranosuke to return Tsukimi’s glasses. This has its downside, however, since while Tsukimi can see better, she can’t talk normally to Shuu like she did earlier in the day. Meanwhile, Shuu still doesn’t seem to realize that the lady-like Tsukimi is the same otaku-like Tsukimi he saw the other day at the Amamizukan. 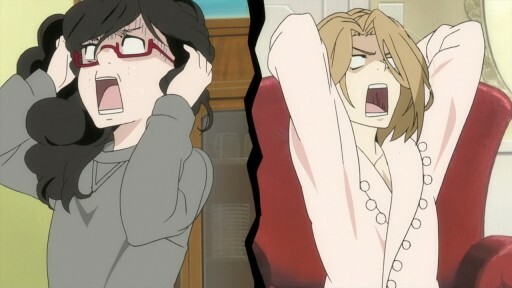 When Tsukimi returns to the Amamizukan, Mejiro has everyone thrown into emergency mode to finish one of her manga, with Tsukimi being the only one who can be treated as a reliable assistant, and in the confusion Tsukimi ends up showing herself in her (very plain) underwear to Shuu, who entered the Amamizukan to say how much he enjoyed the day and leaving with a nosebleed. 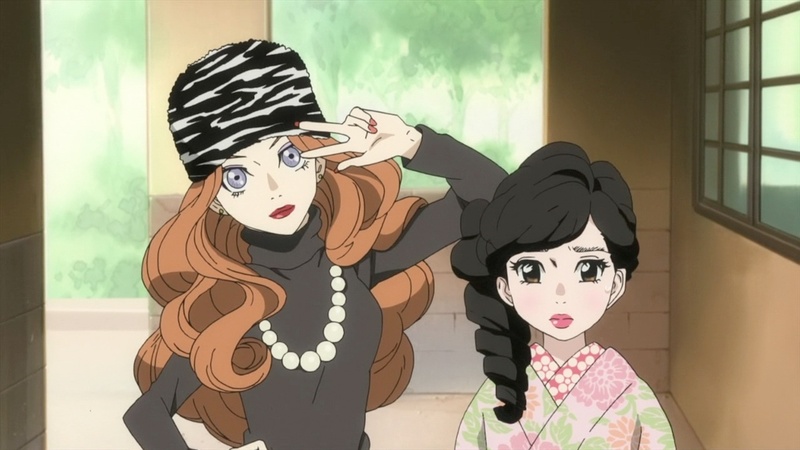 The episode ends with Kuranosuke being extremely shocked at himself for being jealous of the interaction between virgins, while Tsukimi is in shock for having shown what she considers a very unflattering view of herself to Shuu. Kuranosuke himself is almost certainly not a virgin, considering his own attitude and how girls threw themselves at him. But I’m not sure he would have the easiest time seducing Tsukimi if he were to become seriously interested in Tsukimi in a romantic way, considering that he may not have much experience with girls running away from him. Finally, I am going to hazard a guess that the title of this episode is a reference to the Japanese television drama “Let’s Meet in a Dream” (夢で逢いましょう).